Wood, upstairs and downstairs and on the stairs and in the bedrooms. The only carpet left in the house will be the guest room and the tiny section in our closet that I didn’t pull up when I did our room. One would think carpet is far less expensive but that isn’t really true anymore. For a good high end carpet with a nice carpet pad you are looking at $6 a sq foot plus labor. Wood was really about the same if you shop around and our installer has a great labor rate so for a very similar price we get wood. I’ve found that half the people I tried to work with were really really bad communicators. I don’t want to chase someone. The guy we choose is a great communicator and that plus price earned him an entire house rather than just one level. Now this is gross, but, we evaluated the puke/pee potential in our future and decided that while we have been lucky so far wood is so much easier to clean. In Niamh’s pukefest earlier this year I was actually glad she walked up to my room to puke on my floor since it was an easy clean up. The bedrooms are small enough that what they added to the wood bill was really not bad. We ended up getting the wood through Home Depot because we are going with a prefinished floor to avoid the fumes in the house and no contracter really has a better in on this style flooring. This decision also took way too much thinking to finally say that traditional sand and finish might be perceived as slightly better, it isn’t really worth the 2 weeks of basically evacuating the house and at the very least keeping the cats away. With the prefinished there are more visible lines between boards but we minimized that by going with a micro bevel (I’ve learned a lot of new vocab in the past 2 weeks). We are also avoiding the hand scraped look since that translates to ‘choppy looking’ and we want as smooth a look as possible. Prefinished also offers more options in stain and a harder finish so those are both nice things. The final reason for prefinished is that it does not need to be nailed and our family room level is on cement so we could either have 2 different woods on the different levels or go 100% prefinished. color since it really only comes in so many colors rather then carpet that comes in nine million different colors (not that I have analysis paralysis or anything but you know, gotta have a boundary somewhere). Our existing kitchen (in the pic below with Niamh slaving away) is builder standard red oak, as is the moldings and built in woodwork in the house. At first I wanted to match it but learned over the week that matching would look like we lived in a basketball court, and, is nearly impossible since one floor would be new and the other 10 years old. After some discussion, Lars and I both like a darker wood way better anyway. 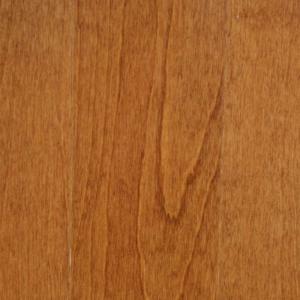 We looked at tons of options and ended up with ‘Gunstock’ in birch. Lars does not like the light/dark variation in an oak grain and I do so birch was a compromise. It will look nice I think, some contrast but not completely different color family. The stairs will be interesting, we are going to go with gunstock tread and red oak riser to tie the two woods together. It will be a unique feature and if I totally hate it, we can always paint the raiser or something. We are also getting something like this stair drawer in the bottom two steps but instead of a pull out the tread will hinge up for a trunk like storage. I am a sucker for nifty storage and the trunk feels safer than a drawer that might get left open to trip on. I’ll definitely have pictures when it is done but the contractor was so excited about the idea he isn’t even charging extra for labor, just the hardware (a hinge I suppose). His plan is to do a thin mdf liner inside the stair, there will be two sides since the stringer will still be in the middle and no need for pull hardware since the riser will have an overhang anyway. Now what to put in there…. It feels good to finally have all the decisions made and a timeline that is actually moving forward since wood got ordered yesterday. As a super awesome bonus, I ordered through my credit card portal and got 10x credit for every dollar spent. That right there is an airplane ticket home~ I love when I make my money work hard for me. Lets see if I’m still super happy about this in 2 weeks but barring unforeseen issues under the carpet it should be fairly easy, especially since a professional is doing all the hard stuff. The next week will be all about clearing the rooms – fun times ahead. Nice. 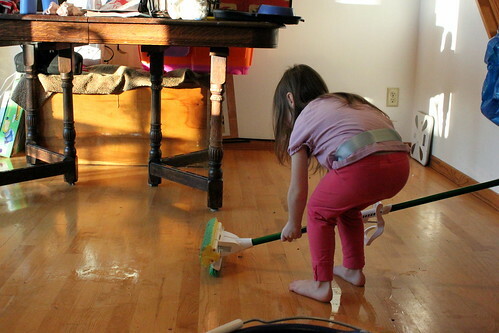 Your wood floors look almost like mine, but mine are a little lighter. We went with lighter wood with a little variation and darker cabinetry. The contrast works pretty well, although SOME people had their doubts, haha. Can I offer one suggestion? Every time we’ve had wood on the stairs, we have lots of falls, particularly when the stairs are carpeted except for the last couple. I’ve the main one that falls, and my mother took a tumble as well. It’s easy to lose your depth perception on those last steps. But you don’t have to listen to me. 🙂 You could use a runner on something to just make it not quite so slippery. You may save a broken bone along the way. But they look great! thanks for the tip – I think we might maybe do something not perminet for when the new baby is learning but I think the 2 tone might help the depth perception thing. Lars already trips up the stairs once a week so I have no hope, just good insurance on him.